As the appointed Engineers for Longswamp Township, Hanover Engineering assisted the Township with the design, permitting, and construction oversight of a new salt storage facility and associated site improvements. 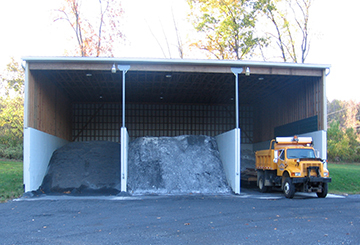 The project included the design of a three-bay salt shed to be utilized by the Township road crew to store road salt. The Township Public Works Department specifically requested that the structure be designed with a roof line high enough so their dump trucks could be completely emptied inside the building. The facility is located at the Township Park and Municipal Complex with direct access from Clay Road. Since the facility is located adjacent to woodlands, the roof system was designed to enable Township personnel to replace any damaged panels themselves, in the event of storm damage, thus reducing potential future maintenance costs for the facility. In addition, a two-part epoxy coating system was developed to cover the 12-foot concrete walls to prevent the salt from deteriorating the concrete over time. The site design for the salt storage shed included stormwater management facilities to address surface runoff, as well as existing springs in the project area. Hanover Engineering was responsible for all aspects of the design and permitting for the project and prepared the construction documents and project specifications for bidding. Hanover Engineering also assisted the Township with construction oversight and project administration during construction of the project.